While on the cusp of the cold season, the dreaded (dare I say it?) — winter — the way I see it, we have two options: we can gripe and groan, stomp our muklukked feet, wave our wind-chapped fists and curse these northern latitudes, OR, we can treat ourselves to the brilliant, brumal poems of the inimitable John Thompson. Thompson was, in the words of Michael Ondaatje, “our bright, brief star." 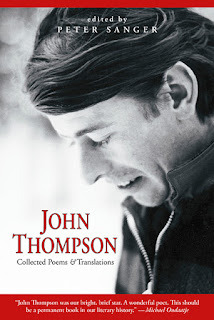 For those unfamiliar with him, John Thompson was an English-born poet that spent the latter years of his life teaching at Mount Allison University while living in the rural village of Jolicure, northeast of Sackville. Thompson wrote two books of poetry before he died at the age of 38 in 1976. His first book, At the Edge of the Chopping there are no Secrets, was published in 1973 and was followed by Stilt Jack, published posthumously in 1978. Stilt Jack is widely referred to as one of the finest books of poetry written in Canada. 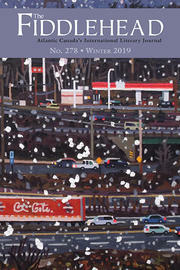 However, the majority of Thompson’s winter poems are from At the Edge of the Chopping; the perfect guide to embracing winter as a time of intense reflection, fierce creativity, and uncanny beauty. At the Edge of the Chopping largely unfolds within a hibernal world of surreal domesticity and rural imagery, where everyday life is strikingly transformed: “in the dark / of the oven,” winter bread becomes a moon that “gleams” and “fattens.” This wintry world is, at times, severe: “I raise my red arm against the wall of the woods: / salute, / it is eaten / into flashes of snow, catspruce needles, shreds.” Its cold is penetrating and meddlesome, “it is that hour when winter, a knife / clean / as the salt wind / probes those wounds we no longer disguise.” But for the most part, winter in Thompson’s poems is a season of vivid, other-worldly beauty; where “deep below the ice the trout / are perfect,” and “the Great Bear” glitters, “dipped, rooting for berries / under the snow in the next meadow.” Life in these poems does not cease, but alters and deepens. behind a wall of frost. Winter with its dark cold days, draws us inward — physically and figuratively. In the words of Thompson, it is the season “of woolen socks, and wine,” when we “build a fierce fire,” and “sip whiskey chilled in the snow.” Yes, you heard the man, winter can be the perfect opportunity to indulge in Dionysian pleasures of drinking and slipping slowly into poetic madness: “It’s in the dark we approach / our energies, that instant / the tide is all fury, still, / at the full.” But in order to foster a deep, authentic appreciation of winter, believe it or not, you’re going to need more than whiskey and wine. The key to savouring this season is learning to be mindful of, and responsive to, the everyday understated moments of grace: “I am content / to reach into the still cold, without dreams, / listening to the voices fading / on the narrow road.” To echo a line from Stilt Jack, absence, in Thompson’s winter poems, makes presence. Looking back now at our two options of how to deal with the immanent icy weather, I think it’s safe to say that reading John Thompson is the far more rewarding. 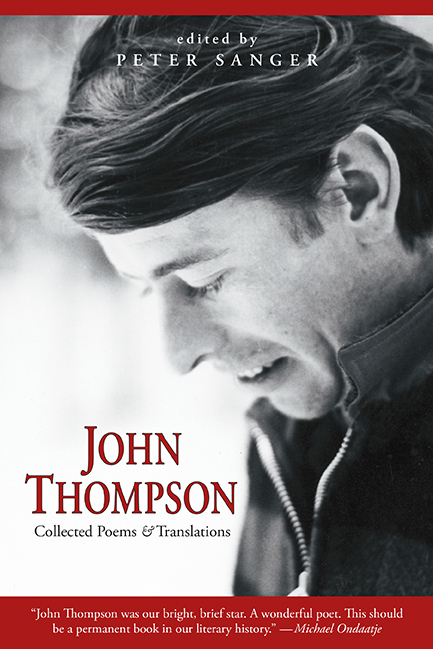 In fact, Goose Lane Editions has recently reissued John Thompson: Collected Poems & Translations, edited by Peter Sanger, so if you don’t already have a copy, buy yourself two — one for yourself, and one for that bizarro relative of yours (who you suspect has a closeted love of poetry). As I’m writing, my own copy of this book is falling apart from extensive use, a bittersweet testimony to its excellence. the breath of our white voices. ** P.S ** For all you die-hard fans out there, it’s about time you revisit Janna Graham's audio documentary, Four Houses of John Thompson, which includes a rare recording of Thompson reading from Stilt Jack — and from all of you first-time listeners, I’ll be expecting your heartfelt thanks in the form of Christmas cards.